Bedrooms are an ideal place to update and upgrade your closets and storage space. 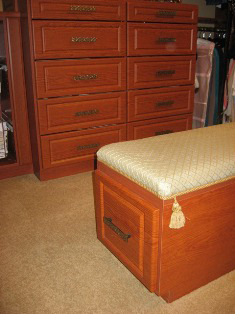 The Custom Closet Company expertly designs custom closet and storage solutions for your bedroom. Don't let small spare bedrooms go to waste, let The Custom Closet Company help restore their functionality in your home. Do you long for the peace and tranquility of a well-organized bedroom tailored to your needs? Are you ready to take control of your overstuffed closets and cluttered dresser tops? Are you in need of a complete closet reorganization? Call The Custom Closet Company today and discover how we can design and install the perfect solution for your bedroom needs! At the Custom Closet Company, we uniquely mix interior design expertise and installation solutions to create the perfect custom design for your bedroom. The Custom Closet Company offers free in-home estimates. Call us today today and schedule your appointment! Our team at The Custom Closet Company considers the problems and needs of your current bedroom organization, then we craft and install well-designed solutions for you.